RadDataForm is data oriented control, which displays the values of a single record or collection of data items from a DataSource using user-defined templates. You can use the control designer to autogenerate its fields. The control provides you with an option to preview, edit, delete, and insert records through the available ItemTemplate, EditItemTemplate and InsertItemTemplate templates. 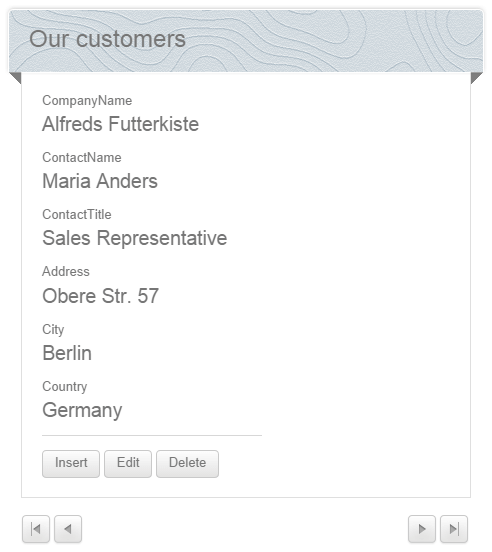 The DataForm also provides EmptyDataTemplate, which applies when the datasource is empty, as well as the LayoutTemplate for easy customization. The control supports the rich set of skins provided by the suite.